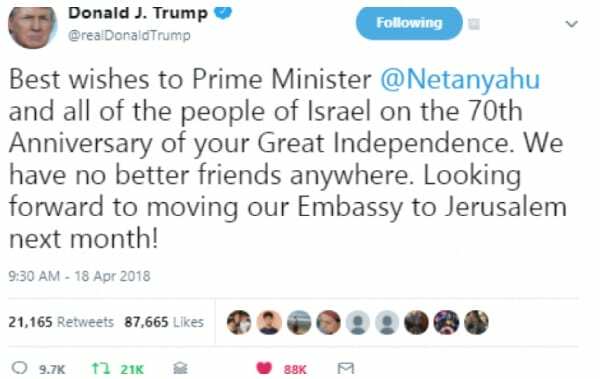 U.S. President Donald Trump issued effusive congratulations to Israel on the occasion of the country’s 70th anniversary, saying the United States has “no better friends anywhere,” and reiterating his pledge to move the American embassy from Tel Aviv to Jerusalem. Trump’s announcement in December that the United States would recognize Jerusalem as the capital of the State of Israel. and therefore move the U.S. embassy from Tel Aviv to Jerusalem, earned him widespread acclaim in Israel, while touching off a firestorm of controversy in the Palestinian Authority and among Palestinian supporters. Since Trump’s announcement, P.A. leader Mahmoud Abbas has publicly cursed Trump, saying he will not engage in any discussions with Israel in which the United States is a broker. A ribbon-cutting ceremony to open the new U.S. embassy in Jerusalem is being planned for mid-May.